We are offering Red Heart Photo Frame to our client. We are renowned and most trusted name in the market offering best quality collection of Heart Shaped Photo Frame that are available with heart shape and looks trendy. Sublimation Cushion Heart Shape Plane available in red, green and blue. This photoframe is made from scrap or recycle wood thus retaining its orignal colors and making each piece unique. You can put photo of your loved one in this heart shaped photo frame. - This photo frame will always catch your attention by spinning around! - Display 2 pictures back to back. - Great as a concept photo frame. - Easy to change pictures. - Works on 3 AA (pencil size) batteries. This photo frame will always catch your attention by spinning around! - Display 2 pictures back to back.- Great as a concept photo frame.- Easy to change pictures.- Works on 3 AA (pencil size) batteries. his photo frame will always catch your attention by spinning around! - Display 2 pictures back to back.- Great as a concept photo frame.- Easy to change pictures.- Works on 3 AA (pencil size) batteries. 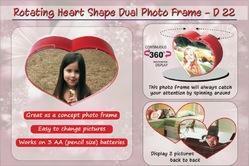 Due to our proficiency, we are engaged in offering to our patrons Heart Photo Frame. We offer this product in numerous designs that meet consumers demand. Our clients can avail premium quality of Heart Shape Wooden Photoframe from us. There is a very special way to give the endearing memories of your life attention they deserve. Have have them professionally framed by us. We have plenty of ideas on how to turn your treasures into beautiful show pieces.